About Jim and how to contact him. Following are images from Shack Bay and Eagles Nest taken during an excursion with members from my Facebook group ND400 Long Exposure Photography. Shack Bay and Eagles Nest are part of the Bunurong Marine Park located between Cape Paterson and Inverloch. Access to the beach is via stairs from the cliff tops. Pictured below – A long exposure image from Shack Bay with the Eagles Nest rock formation in the background. Pictured below – The view from the end of Eagles Nest looking out to sea. Pictured below – Shack Bay looking back towards Eagles Nest. Pictured below, a series of candid images of ND400 Long Exposure Group members at Powlett River on the way back home from the excursion. 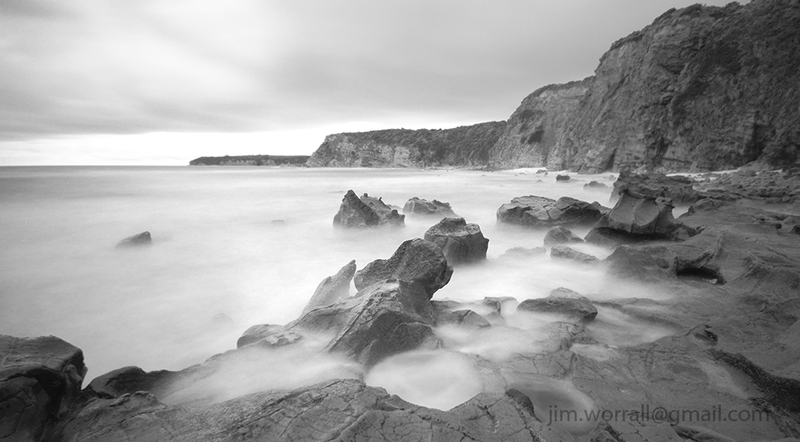 Following are some long exposure images from the picturesque beaches of the Bunurong Marine National Park. Pictured above – Eagles Nest as viewed from the rocky platforms to the west of the formation. Pictured above – The view from Shacks Bay looking east towards the Eagles Nest rock formation. Pictured above – The view from Eagles Nest looking back towards Shack Bay.